CHARLOTTESVILLE, Va. — May 8, 2007 — The Virginia Wine Experience in London, LLC poured 64 high-quality Virginia wines for leading members of the British wine trade and media last Wednesday, May 2nd at Vinopolis, London's unique wine tasting venue. The tasting was a great success, generating impressive reviews from top opinion shapers and creating an awareness of Virginia as a quality wine producing region. The complete list of the Virginia wines presented can be found at wineries link and photos of the event are available on request. All eyes - and taste buds - were focused on Virginia wines, with more than 100 trade and media attendees sampling wine in an intimate, relaxed atmosphere. All feedback received on Virginia wines was positive, but many were particularly impressed with the consistency of wine quality, the wines’ balance and clean fruit flavors, the restrained nature exhibited by moderate alcohol levels below 14 percent, which is unusual for New World wine, and both the diversity of and unconventional range of grape varieties such as the varietal petit verdot and the native Norton grape. High profile attendees included Hugh Johnson, author of the annual Pocket Encyclopedia of Wine, World Wine Atlas and columnist for Decanter; Steven Spurrier, known for arranging the "judgement of Paris" tasting in 1976 which launched respectability for California wines and Decanter columnist; Andrew Jefford, contributing writer for Decanter; and Stephen Brook, the American specialist at Decanter. "As a result of this tasting, Virginia has clearly been established as a quality wine region in the minds of leading opinion shapers in the U.K. wine trade," said Richard Leahy, executive director of the Virginia Wine Experience in London. 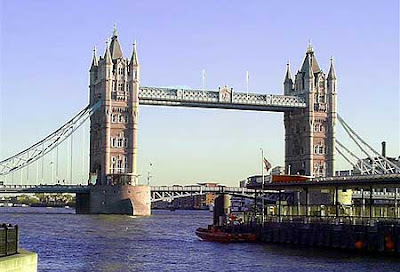 "We made a distinct impression when it came to how leading British wine authorities saw Virginia wines stylistically. Virginia is both geographically and stylistically between Europe and the West Coast, and the tasters in London really understood that. Traditionally, the British think of American wines in the context of the West Coast, with higher alcohol and lower acid levels than we typically get in Virginia, so our wines are seen as a refreshing change." Spurrier said, "An eye-opener for chardonnay and particularly Viognier; lovely Meritage blends." Nick Williams of Morgan Stanley said, "Great variety, [Cabernet] Francs fantastic; When are they available?" Carol Whitehead of Marstone Wine Consulting said, "Sparklers very promising, loved the Petit Verdot examples. Some fine Chardonnays and white blends, good Cabernet Francs too." Christos Ioannou of Criterion Wine Ltd. said "Really liked the quality of whites; elegant, subtle, fragrant, intelligent use of oak. Also liked the Cabernet Francs." Hugh Johnson was so delighted with the Veritas Petit Verdot '05 that he took a bottle with him! Greville Hawanth of Wine on the Web summed it all up when we heard, "Surprisingly impressive!" Congratulations to Crossing Vineyards and Winery for their award winning wine at the 2007 International Eastern Wine Competition. Congratulations to Crossing Vineyards and Winery for their award winning wine at the 2007 San Diego Critics Challenge International Compeition. Congratulations to Crossing Vineyards for winning two Bronze awards in Dallas. NEW YORK GOLD keeps flowing in from the west coast, with a Platinum, 15 Gold, 24 Silver, and 14 Bronze medals at the fabulous Los Angeles International Wine & Spirits Competition held in mid-May, with results released this week. 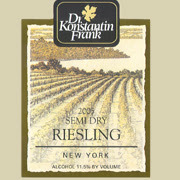 Dr. Frank’s Vinifera Wine Cellars had a particularly strong showing, with its 2006 Dry Riesling earning a Platinum Award, Best of Class, and Gold, and nearly winning Best White Wine honors (which went to a Sauvignon Blanc from our friend Joe Hart in Temecula); other Golds went to the Dr. Frank 2006 Gewurztraminer and 2006 Semi-Dry Riesling, and Chateau Frank 2000 Blanc de Noir. Chateau LaFayette Reneau earned three Golds for its 2006 Estate Dry Riesling, 2006 Johannisberg Riesling, and 2006 Pinot Noir Blanc. Goose Watch got Gold and Best of Class for its 2005 Traminette, and Gold for 2006 Melody, while sister winery Swedish Hill took Gold and Best of Class for its Spumante Blush, and Gold for 2006 Cayuga White and Country Concord. Other New York Golds included Heron Hill 2004 Riesling Ingle Vineyard and 2005 Late Harvest Vidal, and Lakewood Vineyards 2005 Chardonnay. The LA competition, run by Dr. Bob Small and Mary Ellen Cole, is a fabulous event, which also features the award-winning wines and sponsors tastings/seminars during the LA County Fair each September. SAN FRANCISCO INTERNATIONAL wine competition last weekend, another great one, added to New York’s Gold stash, with 4 Double Gold and 8 Gold medals going to New York wineries, along with 14 Silver and 34 Bronze. The Swedish Hill—Goose Watch— Penguin Bay trio of wineries owned by the Peterson family led the way with 3 of the Double Golds and 4 of the Golds. The Double Golds include Goose Watch Diamond (also rated Best Native American White), Penguin Bay Percussion (Best White Hybrid), and Swedish Hill Spumante Blush; Gold medals went to Goose Watch Renaissance Red, Golden Spumante, and Classic Cream Sherry, and Swedish Hill 2005 Late Harvest Vignoles. New York’s other Double Gold was the Heron Hill 2005 Late Harvest Vidal Blanc, with additional Golds for Hazlitt 2006 Riesling, Mazza Chautauqua Cellars 2006 Pinot Gris, and Ventosa Vineyards 2006 Riesling. Hosted by wine celebrity Anthony Dias Blue and run impeccably by Carol Siebert, San Francisco is the first competition to exceed 4,000 entries. DUCK WALK NORTH is the latest addition to the Long Island wine empire of Dr. Dan Damianos and his family, by far the largest winegrowers in New York ’s easternmost wine region. “Dr. 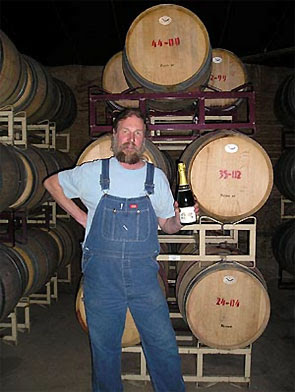 Dan” created Pindar vineyards on the North Fork more than two decades ago, followed by Duck Walk in Southampton (now known as Duck Walk South) and Jason’s Vineyard (named after son Jason, the winemaker) in Aqueboque. Duck Walk North in Southold, which just opened, includes a sprawling tasting room with two bars, a large open-air patio, lots of seating, and a state-of-the-art kitchen—ideal for weddings, parties and corporate events. 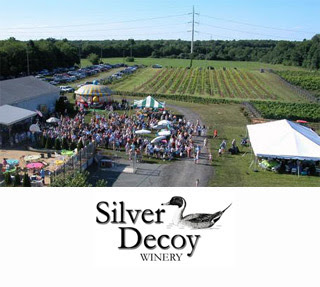 Fortunately, state Senator Ken LaValle has initiated legislation which will clarify the right for wineries to hold catered events, which has been a contentious issue on Long Island . For more information on Duck Walk North, visit www.duckwalknorth.com. Sharpe Hill Vineyard is the award winning winery located in Connecticut's Quiet Corner. Sharpe Hill Vineyard has received over 200 medals in international tastings and is located in the town of Pomfret - just minutes from scenic Route 169 and from the Putnam Antiques District. 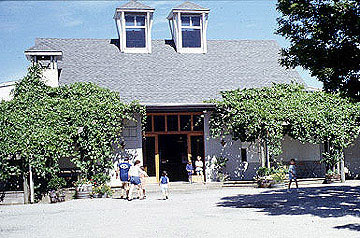 The winery is open year round to the public for wine tastings. In the brand new Wine Spectator, July 31, 2007, Brunello di Montalcino issue, Sharpe Hill's Cuvee Ammi Phillips chardonnay scored a 90! That's more than Cakebread, Clos Du Bois, Grich Hills, Patz & Hall, and a number of other excellent producers. And that's a wine from a Connecticut winery! Cuvee Ammi Phillips, Sharpe Hill's limited edition Cuvee, is made completely in brand new French Oak barrels with Chardonnay grapes from North Fork, Long Island. This full bodied Chardonnay is best when served with salmon/seafood or poultry dishes. It was released summer of 2006. "Pear and vanilla flavors have a touch of honey....Sleek yet rich," wrote reviewer Tom Matthews. This is great news for east coast wine! Order ASAP! 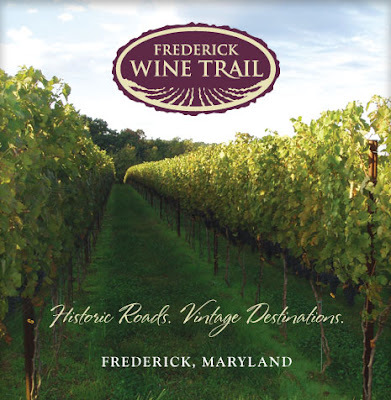 The Frederick Wine Trial is made up of six wineries and their combined 120 acres of vineyards. Together these wineries are responsible for over half of Maryland’s wine production. With the Frederick Wine Trail, you are invited to discover some of Frederick County’s best agricultural bounty: its beautiful vineyards and outstanding wines. From the cluster of four wineries in the outskirts of Mt. Airy to the edge of Montgomery County and even in downtown Frederick, you will find a wide selection of fine wines, warm hospitality and a glimpse of the ancient art of wine making. Frederick County’s unique and varied landscape makes it an excellent site for grape growing. Vineyard site selection is the first critical step in the process of growing grapes for fine wines, and our county, in the heart of the Maryland piedmont, is a unique area where rocky soils and rolling hills create a perfect climate to ripen some of the finest wine grapes. Frederick County is the only county that hosts all 3 of Maryland’s American Viticultural Areas (AVAs): Catoctin, Linganore and Cumberland. As soils, sun, and climate change from place to place, a single variety will produce different flavors. The French refer to this phenomenon as terroir, or the taste of the soil and the growing environment as is manifests itself in the flavors of the finished wine. As you move from winery to winery, you will be able to taste the variety of flavors as diverse as the six wineries themselves. Geographically, the trail is compact enough to allow visits to all the wineries in one day. However, with the many attractions that this historic area has to offer, ranging from Civil War battlefields to Revolutionary War era houses and fabulous antique shops, we encourage you to plan a few weekends to enjoy the offerings of each winery at a leisurely pace. Visit each winery’s events page for more details on how you can spend a day learning more about the tradition of growing grapes and making fine wine that has been a part of Frederick County for over thirty years. The other night Dominique made a fabulous salad of fresh spinach, avacado, fresh corn, and olive oil and lemon, salt and pepper. We started off with artichokes with lemon butter dipping sauce. We were going to eat on the deck in the back of the house, with the sun shining, and the lawn freshly mowed. We need a nice white wine to top it off. And we thought of Eric Frey. 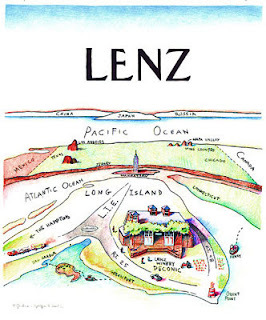 What about a Lenz Gewurztraminer? 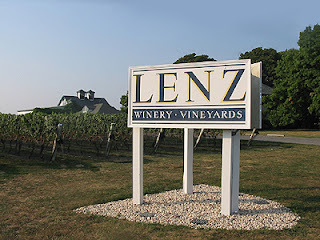 The Lenz Winery is located in Peconic, on the North Fork of Long Island, in New York. 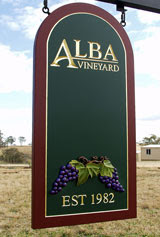 This is a distinct geographic region as well as a designated BATF appellation for US wines. 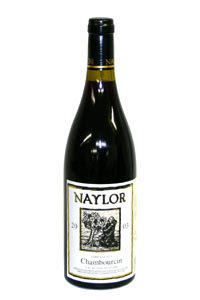 Founded in 1978, the winery has some of the most mature vineyards in the region, or in the country. They grow only vinifera grape varieties: chardonnay, gewürztraminer, merlot, cabernet sauvignon, cabernet franc and pinot noir. They have nearly 70 acres of vineyards. Dominique and I visited Lenz Winery in Long Island when we did the Wine Camp in Long Island. We are big fans of the winery, and we are huge fans of Eric. Eric is a very down to earth type, who loves beer as much as he loves wine. He is open, friendly, and a damned good winemaker. He is not pretentious about wine, but he is passionate. And he is one of those bigger than life characters whose company is easy to enjoy, because he can seem to laugh at himself and not take himself too seriously. The wine went beautifully with out meal. t was an exquisite bottle of wine, which stands up beautifully to some of the best Gewurtztraminers made anywhere in America. It was a beautiful evening. Summer was here. We could take a breath and enjoy.